"LOOK WITH THE EYES, SEE FROM THE HEART". Please contact Curt for photography instruction. I am experienced with 35mm, medium & large formats, and digital photography. 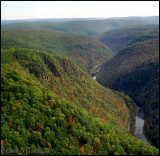 Images here are in & near the Pine Creek area of the Pennsylvania Grand Canyon. For whitewater rafting in the Pa. Grand Canyon please contact Pine Creek Outfitters at: http://www.pinecrk.com/ These people know the business. Pa Grand Canyon from Colton Point St Pk. Morning fog accentuates pine tree. Bear Run Falls........ Bear Run is boundry line for Colton Point St Pk. Civilian Conservation Corps worker at Leonard Harrison St Pk. 8 1/2 X 11; 58 pages, 81 photos. Canyon Panorama from Leonard Harrison St Pk. Biking the Sycamore tunnel, Pine Creek RailTrail. Curt at Water Tank Hollow. After the Fall is nearly over. Pine Creek near Darling Run & the old CCC site. Canyon Panorama from Colton Point St. Pk. Viewpoint at Leonard Harrison St Pk. View from Leonard Harrison St Pk. Leaves circling in whirlpool currents. Pine Creek & the rocks of Pine Island on left. 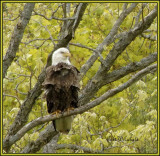 2007 adult eagle on the nest. Pine Creek provides numerous swimming holes. Bradley Wales, looking north to Tiadaghton. Sermon from Chuck of Pine Creek Outfitters. Winter Canyon from Leonard Harrison St Pk. Defining the north edge of Colton Point SP. Very nice photos! I found your card in my pocket, after meeting you at the Cockeyed Cricket. I'm glad that I checked out your photos! Another really nice gallery. Lots of great stuff in this country to see and photograph. Curt love your pics.I have lived[all my life] 80yrs in potter co and never got to see the scenery from the bottom of the canyon-thank you so much.I am into digital and enjoy outside scenes myself.do you have any pics of the rhodendron in bloom? Curt, in years past I've rafted, fished, camped, and hiked the PAGC. Hard to match the quiet and serenity of the entire area. Your pictures bring back great memories.